This response pointedly addresses both parts of the question. And while the general answers provided in the FAQ section appear to be designed to be short and to the point, this answer goes beyond the question and provides the additional information that Mormons also accept other books as Holy Scripture. The answer to the similar FAQ question (noted above) does the same thing, and includes a list of these additional scriptures with a short explanation of what they are. 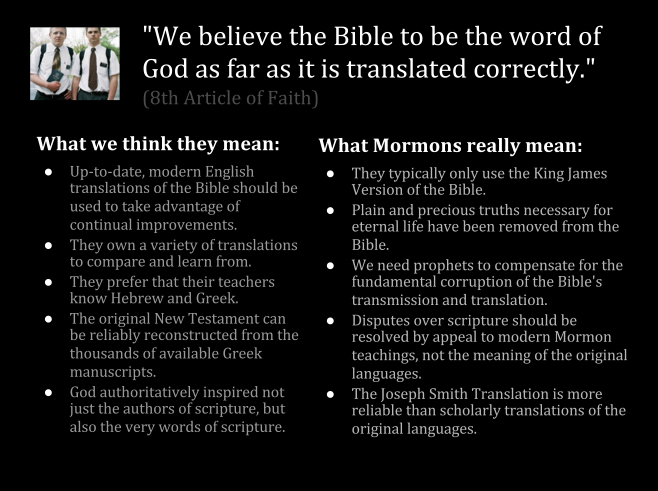 So this leaves me with a question of my own: Why do these official responses to questions about the Mormon view of the Bible fail to include the doctrine so clearly spelled out in the Articles of Faith; that is, “We believe the Bible to be the word of God as far as it is translated correctly” (Articles of Faith 1:8; emphasis added)? It is true that the Articles of Faith can be found elsewhere on the Mormon.org website, yet failing to mention that particular canonized doctrinal caveat renders the response provided by the Mormon Church incomplete at best. The following quotes from faithful Mormon sources will allow the reader to reach a better-informed conclusion about Mormonism’s regard for the Bible. This entry was posted in Bible, Mormon Scripture and tagged Articles of Faith, Bible, Book of Mormon, Brigham Young, Bruce McConkie, Church of Jesus Christ of Latter-day Saints, Ezra Taft Benson, Gordon B. Hinckley, Joseph Smith, LDS Church, Mormon Church, Mormonism, Orson Hyde, Orson Pratt, Richard Bushman, Thomas Monson. Bookmark the permalink. You need to come clean! Those quotes you provided by those Mormon sage(s) are just their opinion. It doesn’t reflect the “current” view of the LDS sect HQd out of SLC. As such, these opinions are just that; what these men as individuals believed. In order for something to “count” in the LDS sect it has to be addressed at conference, the apostles of the LDS church must form a circle on the dais, extend their hands into the middle of the circle, raise their hands over their heads, bring their hands down (in unison) while shouting “GO TEAM!”. Then all of those in attendance must vote by acclamation in one strong voice affirming what the apostles just proclaimed. Now this lasts until everyone walks out of the conference center and folks begin to have their individual personal revelation and opinions. My point? Mormons absolutely hate being nailed down to any sort of standard. It’s no fun! It’s far more entertaining to have on-going, continuous revelation. Let’s face it! That’s why these folks have, in reality, a rather low view of the Bible. It has way too many restrictions and doesn’t reinforce Mormonism. There is no Mormonism in the Bible. There is no Mormonism in the history of the Christian Church. There is no Mormonism in the traditions of the Christian Church. There’s no Mormonism in the writings of the Church Fathers or the heretics who the (Fathers) battled. Mormonism, in the final analysis, is a fly by the seat of your pants religious stew. That’s why the restored gospel, as Mormons refer to it, is continually changing and has so many different sects all proclaiming to be the “one true church” with the “one true living prophet” and “the one true restored gospel”. I say, NO THANK YOU!”. I’ll trust God’s Word. I wonder which question answer is posted here. Regardless, the Mormon view of the Bible is that it is a flawed and ultimately unreliable book. Sure, it has a lot of good stuff in it, but they glean truth from other sources, not the Bible. Its a rather interesting question to ask how they can support anything from it when they say it has been translated incorrectly. They never answer which parts or provide evidence that any of it has been mistranslated. Did I read that wrong? Did Orsn Hyde say that the bible was not meant to guide our lives but yet Nephi has a vision of scripture being passed from the Jewish people to the Gentiles in purity. Interesting. Ok so lets look at Deuteronomy 6. This states that the commandments that we were given by God were to be taught to our children at every moment of the day and displayed on our homes and our bodies to show who our God is. People should be able to see that we serve the one true God by what is displayed in our lives. Our actions should line up with the instructions that were given to us in scripture. The ten commandments were instructions on how God wants us to honor our fellow man and honor Him. We are instructed on how to treat the poor, how to come come before God, how to forgive and how to remember the salvation God has given us and will give us in the last day. If God did not say the things He said with the understanding that we would listen and obey than He must have been speaking just to hear himself talk. And the only scripture that would have been passed on from the Jewish people to the Gentiles would have been the Old Testament, which according to Nephi was passed on in purity. When would this have happened if it actually happened? Through Paul. A pharisee of pharisees. After the death of Jesus. My suggestion would be for people to study how the Jewish people have preserved the Torah and scriptures of the prophets. Even the Jewish people of the times of Jesus called the Torah instruction. The Pharisees and Religious leaders of those times were guided in there decision making by the Torah and the writings of the prophets in the Old Testament. For this guy to say it was not meant to guide our life shows how ignorant he was about the Hebrew culture and the purpose of scripture. How sad that people listen to such untrained individuals. …….and then the rest of the story, which I love. Monks in the middle ages, who were Catholics of course, deliberately left all of the Mormonism out of the Bible when they were translating it. It’s the conspiracy part of the great apostasy premise. And that ladies and gentlemen were the parts that weren’t translated correctly i.e. the parts that left the Mormonism out. Isn’t it fun thinking Mormon? Also, didn’t Smith translate a version? He who translated (the now missing) golden plates also translated the Bible, too. Should be reliable, huh? But do LDS use that version? That is something I grew up with. The thing is, all the things that make Mormonism unique are things that could be used by men to keep control over the people. You have to give money in order to enter the sacred building, in order to get things that will save you or help you progress onwards into the eternities. Mormonism is set up in a way that power is concentrated at one head and people are forced to work through the system in order to have any kind of “true” spiritual life. My question is why would monks or any spiritual leader that is hungry for power through deception want to remove aspects of a spiritual life that in essence give control and power to the system. You want your ancestors saved? Go through the Church. You want salvation? It’s through the Church system. You want to be with your family forever? Only through the Church. You want to be a God? You can! Through the the Church! Can anyone think of a plain and precious truth of Mormonism that would make sense for some monk to cut out if Mormonism was the original truth. As an avid crime TV watcher, I’m looking for an MO, other than Satan told me to do it. a balloon in order to muddy the water concerning the trustworthiness of the Bible etc. for anyone to find out about His Son —Jn 20:28-31 .
order to see how they ended up becoming followers of latter days prophets of Mormonism . same church he served in — now restored 1700 years later by God through a latter day prophet. doctrine for over a century by these latter days prophets . in the latter days with their new scripture and doctrines . It’s about Jesus , not Joseph . 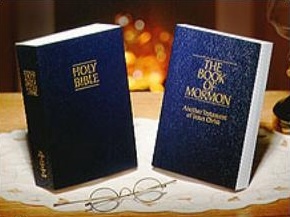 Mike, I agree with you that most Mormon admire the Bible and do rely on it to glean truths from. I say it is ultimately an unreliable source to them because that is the only logical conclusion to the idea that it is correct only so far as it is translated correctly. If it is not translated correctly, its truth is hard to discern. However, there are other sources of discerning truth to Mormons. This allows them to find their ‘truth’ in the Bible that comes from the angles presented by the other sources. With the other sources, they can come up with doctrine that is supported in the Bible to support their ultimate positions. What this means is that the Bible is not the ultimate source of their ideology but rather becomes a mirror to reflect what they want it to reflect. The ultimate source are the other sources of doctrine to them the BoM, their prophets and leaders, their other sources of scripture, and personal revelation. They put the cart before the horse, so to speak: doctrine pulling the Bible rather than the Bible pulling doctrine. The mantra that the Bible is only correct so far as it is translated correctly allows this mode of t hinking, because naturally the prophets and other sources must be correct, so they would know how to interpret the Bible and what it really means and should say. This, of course, leaves little room for the Bible to speak for itself. Forgot to add this: the reason, therefore, that the Bible is an unreliable book is that because it is only reliable in so far as it supports the LDS program and belief system. Any other way to read it is false and is demonstrative of how it has been corrupted in the past. Sure, its great as long as supports their own view of faith. Anything that doesn’t can be a product of falsification in the past. In writing this, I have to think of how we approach the Bible. I think we generally approach it with an open mind to alternative approaches. However, that which does not fit with the rest of the Bible itself is suspect. We view the Bible as a consistent story from start to finish, yes, including the Old Testament. Yes, there are differences between the old covenant and the new, but those are resolved by looking at God’s ultimate plan and what He achieved when He took the form of man through Christ Jesus. That understanding is found within the four corners of the Bible. There is no need to go elsewhere to find truth. Do Mormons use the Bible as a teaching tool, short answer, no they don’t. Do they use the Bible as a means of discerning truth, short answer, no they don’t. It’s all talk, it’s about ‘appearing’ to use the Bible & the reality is far different. I’ve used my ex as an example in the past & I’m going to do it again now. It was reading the Bible that brought her out of the LDS & a couple of days ago she ran into a friend of hers from the ward, this friend asked her why she had left the church & my ex told her, quoting numerous passages from the Bible to show how she had been taught lies. To cut a longish story short, this friend who has been a mormon for over 40 years & presumably knew the Bible inside out, was shocked. “I never knew that” was her oft repeated response. “Monks in the middle ages, who were Catholics of course, deliberately left all of the Mormonism out of the Bible when they were translating it. So the bigger question that needs to be asked is? When JS translated the BoM, who deliberately left all of the Mormonism out of the BoM? i have read the BoM, and Mormonism as it is believed and practiced simply is not in the BoM, Thats why they need so called prophets. Also they dont trust the Bible, but yet they quote it and use it, so when ever I ask, how can you quote it if you dont trust it? They never can give me an answer? As like the last topic, where are all the LDS to set us straight? Typical of the like of ralpf and FoF. Usually at this point in the discussion about the reliability and inerrency of the Bible, one of our favored TBMs shows up and has all kinds of quotes from some atheist website challenging the authenticity of the (Bible). These TBMs can’t quite grasp the irony of their aligning themselves with a bunch of folks who don’t believe in God. When we talk about the inspiration and inerrency of the Bible what we’re talking about is the original autographs not the copies. However textual research, looking at various copies of the oldest manuscripts to see agreement, shows something like a less than 1% variation (between texts). The most important thing to keep in mind is that these differences are very minor and don’t effect the basic doctrines of the Church. So the Mormon narrative is based on pure folly. All we need now is some Mormon showing up screaming “the Council of Nicea” and the thread will be complete. So how far would a Mormon get who proclaimed, “I’m going to follow the Bible and not the LDS prophet. I believe the Bible is the Word of God and is His final revelation to mankind concerning His nature and plan of salvation.” Can a Mormon get away with saying such a thing? Really that’s what it comes down to because the LDS church has chosen men who call themselves prophets over the Word of God. We have a mountain of evidence that the Mormon prophets have led their believers down the wrong road at every turn. So if a Mormon would desire to find the truth, it’s not with these false prophets but with the revelation God has given us. I imagine Mormons think they’ve got this hot deal going with their so called “living prophets” as opposed to that old corrupted and unreliable Bible that Christians are guided by. See, with a living prophet, the believers get frequent updates with changes that are made in the system. I’m thinking that it’s their vision that they have a guy like Moses who goes up on the mountain and communes with God. This goes under the heading that a “sucker is born everyday”. Who’d believe that these guys are prophets when their track records are atrocious and they flip-flop like dying fish? If these guys are prophets then the bar is set very low. Anyone could be a prophet and that’s why there are so many sects of Mormonism. The foundation of Mormonism is all wrong. The Bible tells us that if you build on a foundation other than Jesus Christ, you don’t have a solid basis for your faith. The Mormon people are counting on the Mormon system to save them, which includes prophets that couldn’t prophesy their way out of a wet paper bag. The proper foundation is Jesus Christ as He is revealed in the Bible. Take that away and you have a man-made religion of worthless rituals and meaningless works. God’s revelation wasn’t meant to be a slow roll-out! It was meant to be concluded in Christ. Nothing to add to it. When Jesus said, “It is finished” what He was saying is, “The debt is paid”. Once the debt is paid, there are no more payments due. There was one payment. The foundation that Mormons are trying to build on is a religious system with an end result that men are said to become gods. In order to pull-that-off Mormons have to come up with a whole different scenario. In that scenario the gospel is lost and the Bible is lost. With that scenario than these false prophets can do whatever they want to do. What they do is with hold the means of salvation which is reconciliation to God through faith in Jesus Christ. resurrected Savior then and received forgiveness , complete pardon , and eternal life . If a couple of young guys come knocking on my door claiming that their religion is all that because they have living prophets, I’d ask them to provide some proof/validation for that assertion. Just claiming something doesn’t make it so. If they then would tell me to read the BoM and pray if it’s true and wait for a validating feeling, I’d tell them to forget it, I’m not interested in feelings that are suppose to equate with a message from God. So having shot down their best play, there really isn’t any where for these young guys to go. But before I’d dismiss them I’d ask them to tell me who their god is. If they’d be honest they would describe a pantheon of gods and a process of men becoming gods not accounted for in the Bible. I would then ask them how they could claim the Bible as one of their Scriptures when they don’t even believe in the God that is revealed there. TBMs who show-up here occasionally will pull out what they think is their trump card and ask me how I can know the BoM is false if I haven’t read it? The simple answer is that according to their religion, they worship a different god so why would I bother to read their book? I already know the outcome. I don’t have to shoot-up with heroin or down a fifth of Jack Daniels to know what the results of doing so would be. Besides I know the Mormon game. The only acceptable answer to the challenge to read the BoM is that it’s true. It’s a fool’s challenge. Interestingly enough we aren’t told to read the Bible, pray about whether or not it’s true and then wait for a feeling to confirm (if it’s true). Our faith is based on the claim of Jesus being the Messiah regardless of how it makes us feel. I’d suggest that Mormons read the NT and see if it’s consistent with what their Mormon sect teaches. What a Mormon who would do this would “feel” is probably depressed and convicted. Actually I feel miserable when I consider what Jesus did for me in the sense that my sin put Him on the cross. At the same time I rejoice that God loved me so much that He would do this to redeem me. their heart about their need for Jesus —-Rom 10:9-13 .
follow these types of latter days day prophets . me . It hurts to see this happen , but it’s a danger we should expect in these days —2 Tim 4:3,4 . This thread has shown me another way the LDS system acts to trap people in by an appeal to authority. Everything flows through that chain of authority, and anyone who goes against that authority is deemed apostate and therefore bad. The practical effect of this is that leadership becomes king, no matter its appeal to Christ. Christ, though, can speak for Himself, and is ultimately our King and savior. One thing that makes the bible hard to understand for Mormons is that terms are defined different. They have been taught that Jesus refinanced their sin debt and that they need to be obedient to the teachings of their Prophet/law (similar to the old covenant) to be worthy of a place in heaven.